Today's floral card will put you in the mood for Spring! 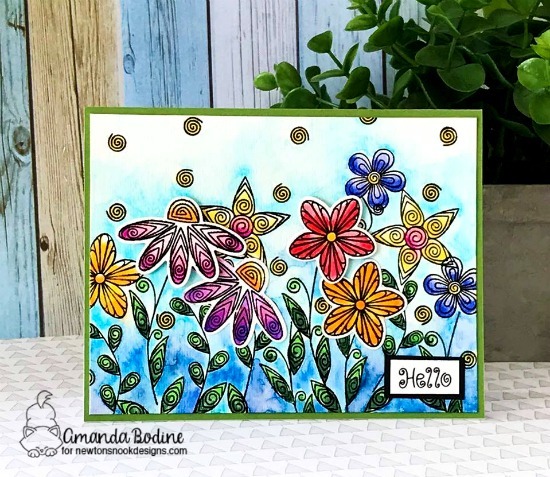 Amanda created a whole garden of flowers on this card today using blooms and stems from our Beautiful Blossoms Stamp Set! She created this panel of pretties by stamping a bunch of stems and a few blooms on the base layer. She added some lovely blue watercolor around them and and colored them in fun bright spring colors. She also stamped a few more blooms on a separate piece of paper and cut them out using the coordinating Beautiful Blossoms Die Set. Adding the die cut flowers over the top really gives this card some fun dimension! Just like a field of flowers blowing in the spring breeze! She finished it off with a little "Hello" sentiment from the Beautiful Blossoms Stamp Set! Thanks for the beautiful inspiration today, Amanda! To see more of her beautiful coloring and projects, visit Amanda over at her blog, RutabagaPie Designs!